I received this box of Peach Tranquility from a friend who gave it to me and said “I thought you might like this”. Well, it’s a form of tea so chances are pretty high I’ll love the fact that someone saw tea and thought of me. That said, this isn’t one that I’ve tried before. 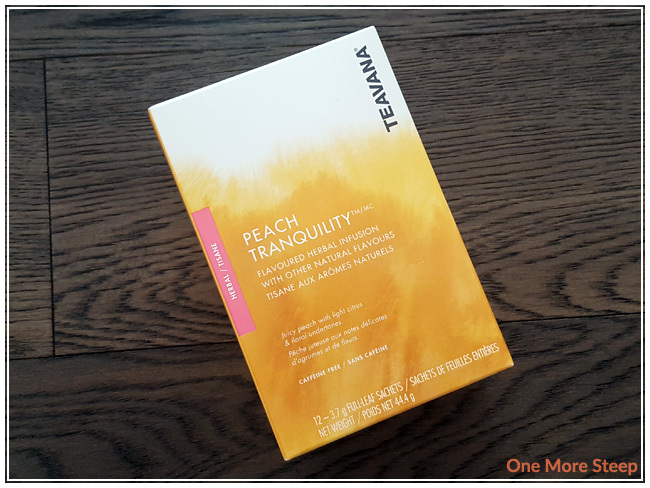 Peach Tranquility comes in a fairly large box for the fact that it only contains 12 individually wrapped sachets (spoiler: most of the box was completely empty/filled with air). Peach Tranquility came packaged in tea pyramids, and each pyramid comes in an individual foil packet. Not entirely the greatest for the environment, but what can I do about that? The smell is amazing, Peach Tranquility smells strongly of peaches with soft floral notes in the background. In reality, peaches are actually low on the ingredients list. 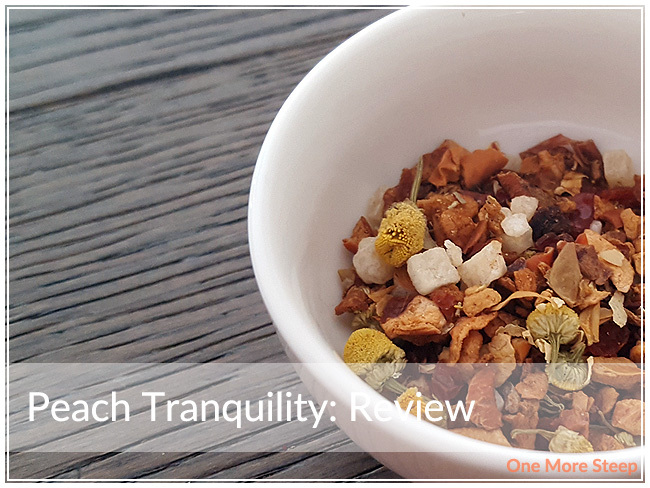 Peach Tranquility consist of: apple pieces, candied pineapple pieces, rose hip peels, chamomile flowers, natural flavour, peach pieces, citric acid, and lemon verbena. Teavana recommends steeping Peach Tranquility in 96°C (205°F) water for 5 minutes. I followed the steeping instructions for my initial steep of Peach Tranquility. Peach Tranquility steeps to be remarkably pale, with a light orange-yellow colour. The aroma that comes up from this fruit infusion is divine though, smelling sweetly of peaches and pineapple – it’s a nice tropical blend with a floral background, much like with the dry leaf. On first taste, I mostly taste the peaches. There’s a nice sweet pineapple flavour that lingers in the background, and the floral notes were mostly found at the end of each sip. Despite all the fruit in this tisane, and the fact that the pineapple was candied, it’s not as sweet as I was expecting. 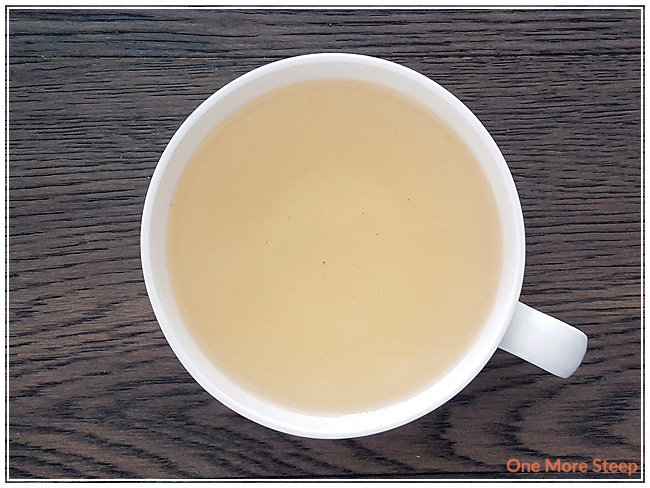 I did try a cup of Peach Tranquility with a touch of sweetener added (I used agave syrup) and I found that the peach flavour was even stronger once boosted by some sweetness. I also poured out a cup to be iced and found the fruit infusion to be even better when iced than hot. I attempted to resteep Peach Tranquility. I found the flavour to be lacking from the peaches, pineapples, and floral notes that I enjoyed in the initial steep. I would say that Peach Tranquility is good for one steep only. 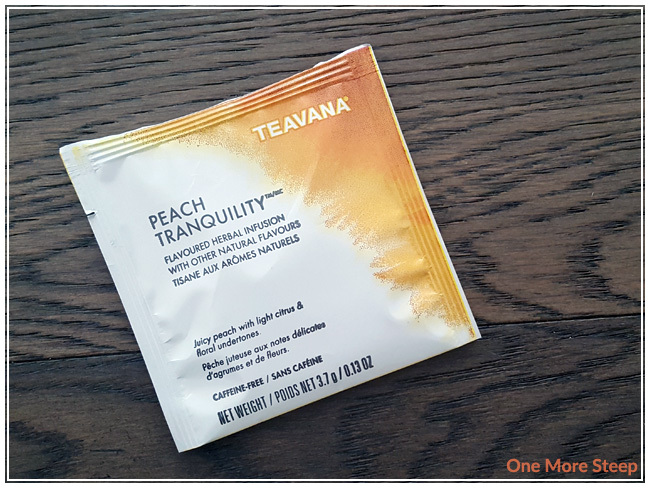 I liked Teavana’s Peach Tranquility. 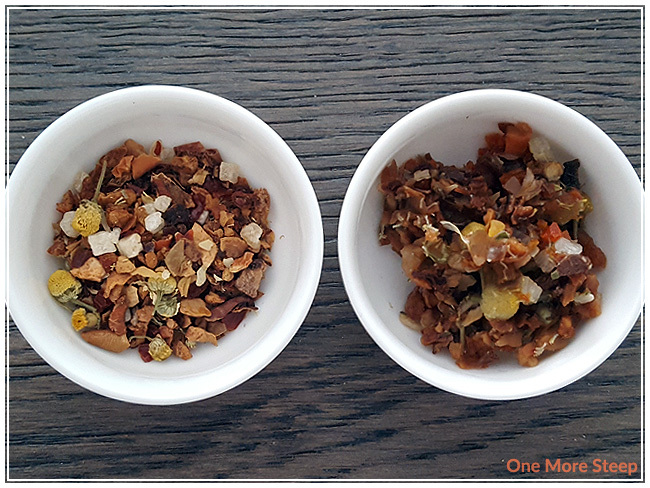 I really quite enjoyed the first steep of this tisane, especially with some added sweetener and iced. I’m always going to be a bigger fan of fruit infusions iced over hot. I found that the peach flavours were quite refreshing, but it needed just a touch of sweetener to boost the fruit flavours. Unfortunately, this tisane did not do well for a second steep. 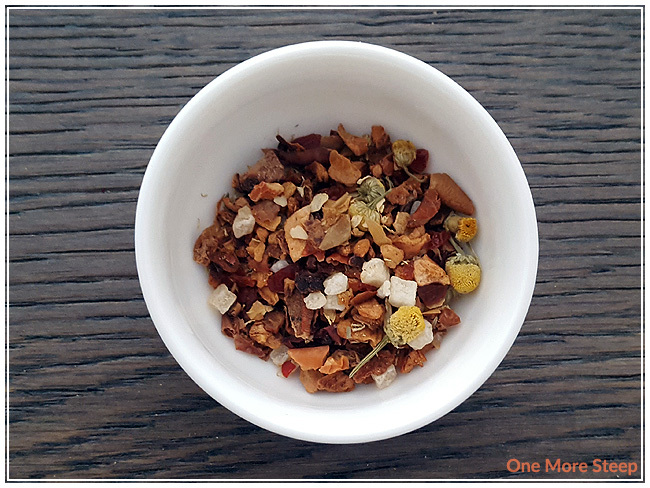 Luckily, I’m not head-over-heels in love with this tea, as I suspect that I would have issues finding more of it as the Teavana retail locations are closing this month in Canada.